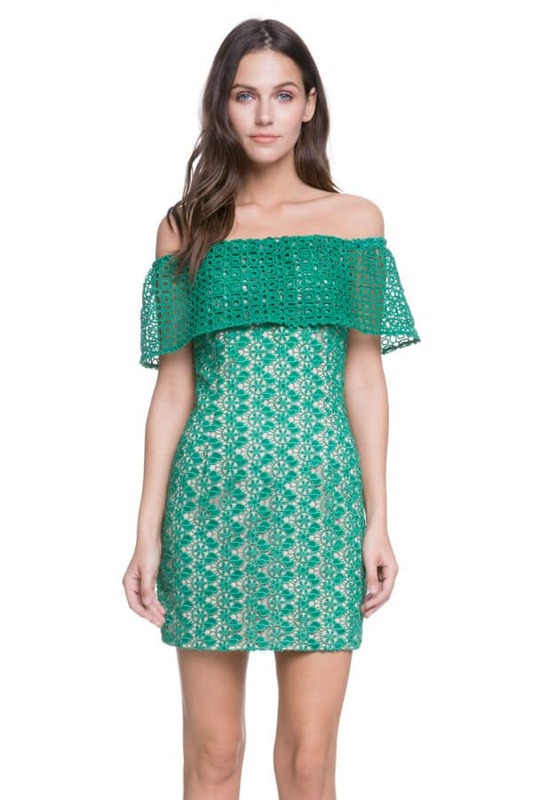 Looking for petite dresses for wedding? You have come to the right place. When the trees start to turn green and flowers begin to bloom, Spring is around the corner and Summer won’t be too far away. The warm weather brings us the favorite wedding times of the year. Have you already gotten wedding invitations and started wondering what the best petite dresses for wedding? You are not alone. This time of the year is when a lot of us are anticipating attending a wedding and trying to figure out what is the best to wear to a wedding as a petite woman. When you are planning petite dresses for wedding, the first step you should take is to look at the wedding invitations for the dress code. Typically, the couple will include wedding guest dress code on their invitation, and that should be your ultimate guideline as to what to wear to the wedding. In this post, we will first go over the most common types of wedding dress codes that you might find on the wedding invitation and what you should know about each type. Are you going to the wedding with a plus one? Don’t worry, we will look at how to interpret the the dress code not only for the ladies, but also for the men. Then, we will talk about our suggestions on the best wedding guest dresses specifically. Now, what if your wedding invitation does not mention any dress code? We’ve got you covered as well. We will talk about what is the best petite dresses for wedding in that scenario. First things first, here is the most common types of wedding guest dress codes that you will see in most wedding invitations. The white tie is the most formal dress code. In fact, according to Wiki, “white tie” itself doesn’t necessarily refer to wedding guest dress code. Any formal event could request “white tie”. If you have never been invited to a white-tie event before (most of us probably have not, unless you are part of the royal world), think the White House state dinner or Met Gala. It often times involves red carpet, celebrities and camera flashing. Even though it is rarely seen on today’s wedding invitations, it is still good to be educated about the etiquette. Even though this is the most formal type of wedding guest dress code, there is no clear restrictions on what the women should wear. Traditionally, a ball gown (long evening gown) will be considered appropriate for a white tie wedding. You probably also want to complete the whole look by wearing jewelry and even evening gloves. The dress code for men is stricter than for women. Traditionally, men should wear a black dress tailcoat over a white starched shirt, marcella waistcoat and the white bow tie worn around a standing wingtip collar. Be mindful that it should be a tailcoat instead a regular suit, and it should be a bow tie instead of a regular neck tie. This is the second most formal type of dress code. According to Wiki, black tie is semi formal, but for most of us, this might be the most formal type of wedding you will attend, because white tie weddings do not happen that often in day to day life. Traditionally, women should wear full length gown or tea length (below calf length). However, in modern days, black tie for ladies is sometimes used interchangeably with cocktail attire. What that implies is if you are wearing petite dresses for wedding, it doesn’t need to be ankle length or even tea length. It could be modestly shorter, but probably not mini dresses. You are not restricted to only petite dresses for wedding. Evening pants (either palazzo cut or other dressy looking pants) are also acceptable for black tie evening. Traditionally, tuxedo and accessories are the preferred attire for men to attend a black tie wedding. Typically the ensemble includes a black dinner jacket (tuxedo), and matching dress pants, a black formal waistcoat or black cummerbund, a white formal shirt, a black bow tie, black dress socks and black formal shoes. While white tie is strictly regulated, black tie can have more options. For instance, the waistcoat is optional. Also, you can wear a black long tie instead of bow tie. Black tie optional still means the couple want guests to dress up, but it means even more flexibility for the wedding guests to choose from what they want to wear. In stead of formal petite dresses for wedding (gown), women can wear cocktail attire as long as it is dressy enough. You choices are not limited to just dresses either, it could be jumpsuits, separates and anything else appropriate for the venue. The keyword here is still “dressy”. Instead of a tuxedo, men can wear a dark suit (navy or dark grey are perfect). Instead of a bow tie, men can wear a neck tie. Men should wear the suit with a pressed dress shirt and a solid tie to dress it up. Black tie is most safe, even though it is not strictly expected. Cocktail attire might be one of the most popular wedding guest dress codes, because it falls between formal and casual. The wedding couple is giving guests a lot flexibility in terms of choices. In terms of formality, this is one step down from the “black-tie optional”, and you have a lot more options to let your personality shine. Put on your best cocktail dress and pair it with your favorite jewelry. Don’t restrict your choices to only wedding guest dresses either. You can totally wear a dressy jumpsuit and put on a pair of stiletto. Some sparkling jewelry will give your wedding guest look a nice finish touch. 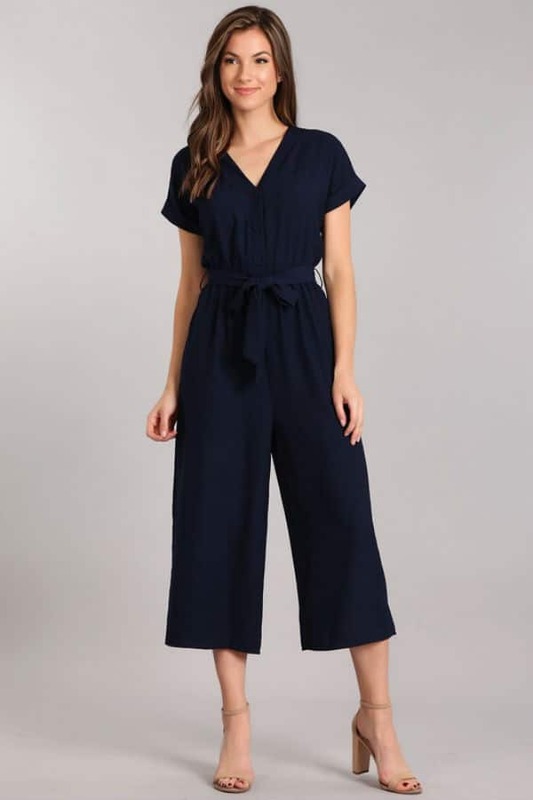 If you are not a big dress or jumpsuit person, opt for a nice blouse with a pair of well tailored dress pants or palazzo pants made of fine quality fabrics like silk. Men also have more options. The best news is most men can most likely wear the items they already own in their closet (instead of getting a tuxedo like requested by the more formal dress codes). Men can wear a dark suit – solid dark navy or charcoal are perfectly appropriate. 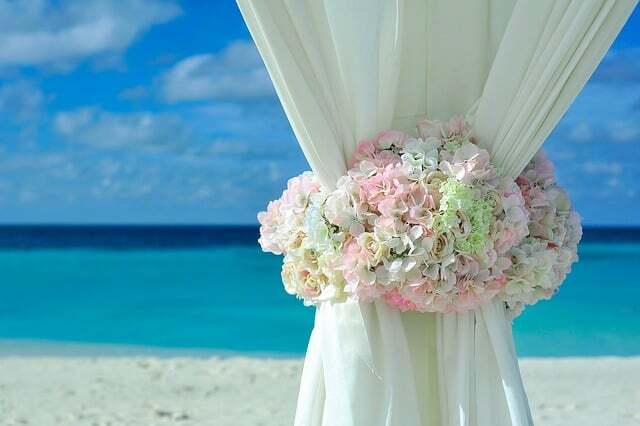 This means the wedding is taking place at a beach venue, and the wedding couple want the guests to dress in elegant attire that suits the beach theme (think the sun, the ocean and the sands). 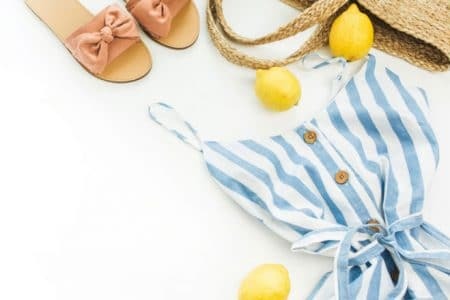 If you have not been to an event with “beach formal” dress code before, just think about what you would wear to a fine dining restaurants by the beach. You have many choices for petite wedding guest dresses. You could wear your favorite maxi dress, a dressy jumpsuit, or palazzo pants. If you do opt for a dress, a petite maxi dress is perfect for the beach theme. Or, you could also choose a tea length or knee length dress. Since the wedding venue is by the beach, a summer suit with a linen shirt and linen pants are the best. No ties are required. Casual normally means there is no strict restriction for what the wedding guests should wear. Does that mean you can put on your favorite T-shirt and jeans? Since this is a wedding, it is still a formal event at the end of the day. You should still dress appropriately to show the respect for the couple, their family and other wedding guests. Read our post on “What to Wear to a Wedding if you are Petite: 9 Common Mistakes to Avoid”. The best petite dresses for wedding? Be yourself and pick out what you feel like is most YOU. As long as it’s not too tight, too short, or too revealing, you are good to go. If you are not a big fan of dresses, it is perfectly fine to wear separates as well. A feminine blouse and a pair of well fitted dress pants will work out nicely for the occasion. Even though the invitation says “casual”, that is not giving out the pass to wear jeans and sneakers. For the men, a button down shirt or polo shirts are appropriate for this dress code. Now that you have the basic understanding of the most common wedding guest dress codes, let’s look together at what are the best petite dresses for wedding for you, and what other options you have besides dresses. We recommend you have at least one of these in your closet, so that you are prepared for a short notice event and won’t stress over what to wear. For the weddings, having a maxi dress is especially handy because you can style it to be formal or less formal, depending on the wedding dress code. If the wedding dress code says “black tie-optional” or “cocktail attire”, wear a maxi dress with your favorite high heels and a nice evening clutch will make you shine through the night. If the wedding invitation says “beach formal” or “casual”, you can pair them with flats or dressy sandals for more comfort. A lace dress of tea length the safest and most versatile choice for you in the wedding season. First of all, what is tea length? A tea-length dress is one whose hemline falls “above the ankle and below the knee.” Originally, the tea hem fell just above the ankle, but the modern tea-length dress is more likely to hit 3 to 4 inches above the ankle, in the mid-calf region. In other word, the other popular name for this length of dresses is the “midi dress”. Normally, the midi length is harder to wear for petite women, because your legs might look cut-off which would make you look shorter. The good news is the lace compromises that risk, because the fabrics are more airy and light. Of all the petite celebrities, Emilia Clarke (the dragon queen in Game of Thrones) gives short girls lots of inspiration on wearing lace midi dresses. 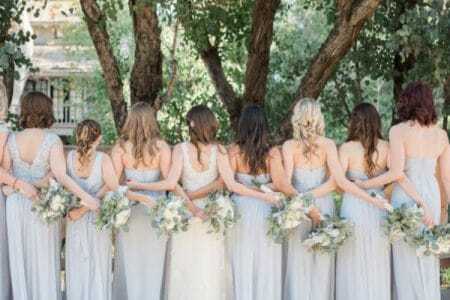 Why is the tea length the most popular petite dresses for wedding? Tea length dresses are suitable for most types of wedding dress codes. As a wedding guest, dressing appropriately for the occasion is the number one priority. So, you want to avoid anything too short or too revealing. Midi dresses are the length acceptable in most weddings. Besides, lace dresses are perfect for weddings because they are elegant and “dressy”. Since “white tie” hardly comes around, and even “black tie” is not as commonly seen as the other less formal wedding dress code, do you need a formal gown? First, since formal gowns are not cheap, you want to have plenty of time to try on different styles of full length petite dresses for wedding and find what suits you the best. Second, sometimes you may need alterations, so you want to make sure you have ample time to do that. 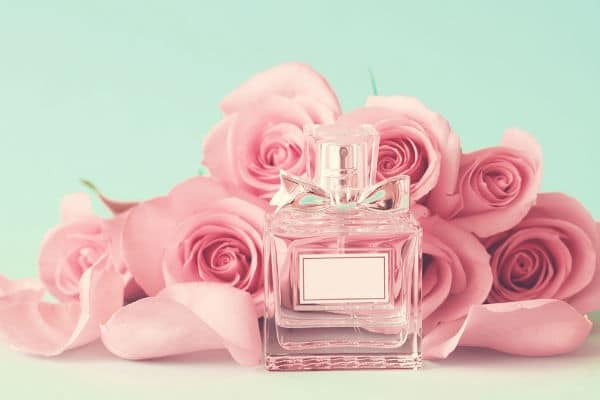 Last but not the least, formal gowns also request more thoughtful choices for the accessories such as the jewelry, bags and shoes that go with them. You need to make sure to spend enough time to put the whole ensemble together. Read our guide on “How to Style Petite Formal Long Dresses“. Petite dresses for wedding are not your only option to wear to a wedding. If you are not a dress person in general, there are many other outfits you can wear and they are totally appropriate for weddings. That is why we have another post to talk about the other wedding guest outfits for petite ladies that you can consider. 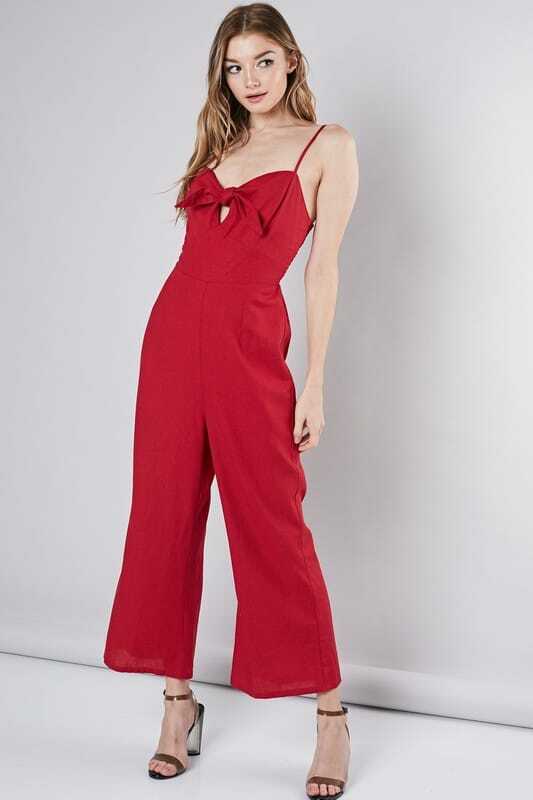 To name a few, a petite jumpsuit works great for weddings because they are automatically dressy. Or, you could consider a palazzo pants for a beach wedding or a destination wedding. A blouse and petite dress pants are another great option, when you want something different than petite dresses for wedding.